St Mary-le-Bow was built c.1080 by Lanfranc who accompanied William the Conqueror to become his Archbishop of Canterbury. St Mary-le-Bow was part of a building project which encompassed St Paul’s and the Tower as a way of indicating that the Normans were here to stay. 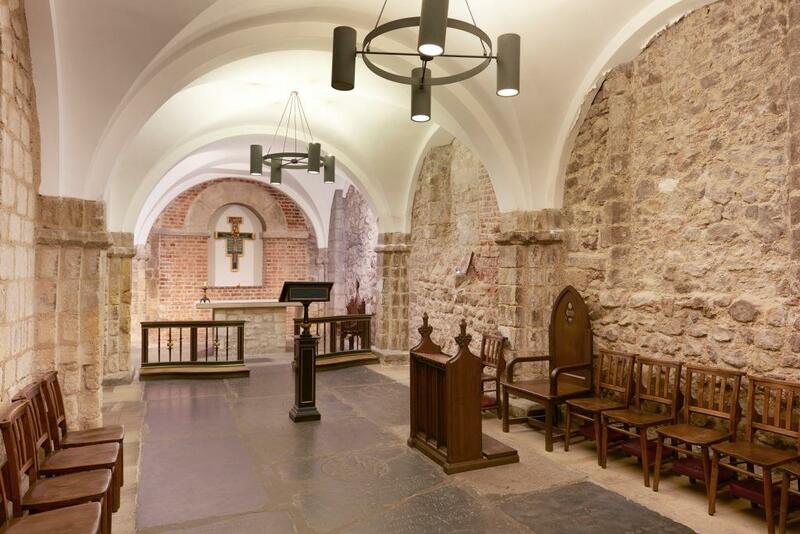 St Mary-le-Bow was the Archbishop’s London headquarters and the ‘le-Bow’ designates the distinctive Norman arches which were such a prominent part of the new architectural style and which can still be seen in the undercroft or crypt. 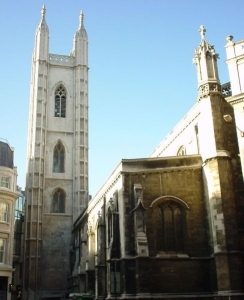 In the middle ages St Mary-le-Bow was famous as the home of the single ‘curfew’ bell which rung from the site in the middle of London’s central street – Cheapside – to indicate the end of the working day. This ringing was picked up at the gates and the City closed for the night. So if you could hear Bow bell – you must be a Londoner or ‘cockney’. The church was destroyed in the Great Fire and rebuilt in restrained baroque by Christopher Wren. The tower (now with twelve bells – the Bow bells) was Wren’s most ambitious and expensive project after St Paul’s and at the time not wholly appreciated. The bells came crashing down in 1941 when the church was destroyed by enemy action. The church was rebuilt in 1960-4 by Lawrence King and the bells were restored in 1961, at which time they were inaugurated by HRH The Duke of Edinburgh. The architecture is still Wren’s but the atmosphere and fittings are more modern and liturgical giving a light and open aspect befitting a place of debate, exchange and dialogue. 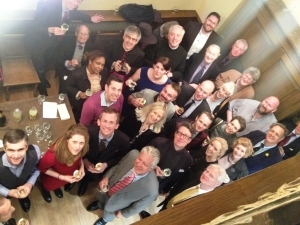 St Mary-le-Bow has a historic reputation for public discourse and these conversations have taken a number of forms since the church’s rebuilding in 1964 – particularly the regular lunchtime dialogues. Trinity Wall Street is St Mary-le-Bow’s sister church in New York. Founded in 1697, its Vestry was commanded to do everything ‘according to the use of St Mary-le-Bow’. Trinity gave substantial monetary gifts towards the cost of post-war restoration of St Mary-le-Bow, and to the recent organ project. The parishes continue to share in their exploration of mission and ministry in the world’s financial and business centres. 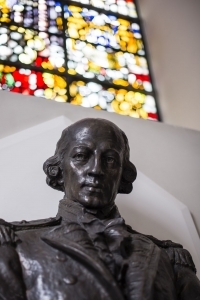 In the south west corner of St Mary-le-Bow stands a bust commemorating Admiral Arthur Phillip, founder of the settlement at Port Jackson (Sydney): ‘In honour of Admiral Arthur Phillip, Citizen of London, founder and first Governor of Australia. Baptized All Hallows Church Bread Street 1738. Entered the Royal Navy 1755 and died 31st August 1814.’ His birthplace was within the parish of St Mary-le-Bow and there is an annual commemoration service on or near Australia Day. As the ‘Australian church in London’, the Britain-Australia Society and the Order of Australia Association hold their annual Christmas Carol Service in the Church. 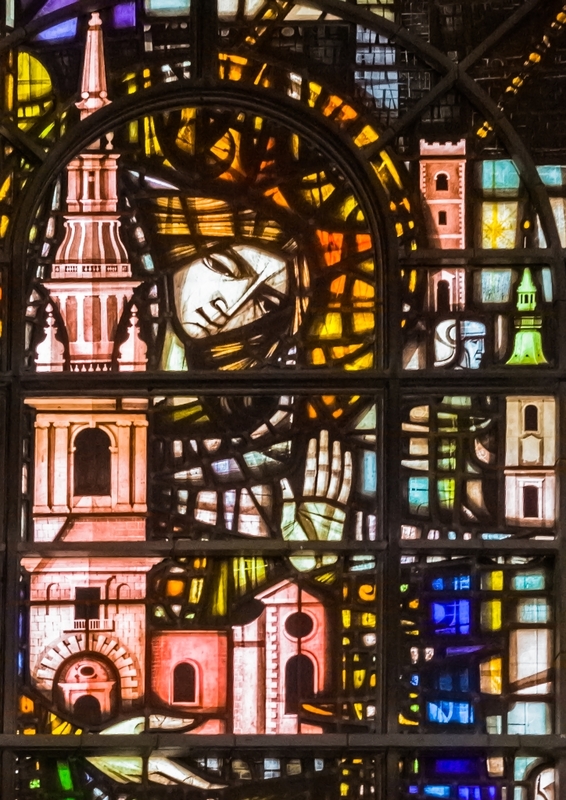 There has probably been a church on the site of St Mary Aldermary in Bow Lane for over 900 years. “Aldermary” (Older Mary) could imply that it is older than St Mary-le-Bow. An early 17th century building was virtually destroyed in the Great Fire 400 years ago and the present building, which survived the Blitz relatively undamaged, is a Wren design from 1704 and unique because of its Gothic style with an interesting fan-vaulted ceiling. 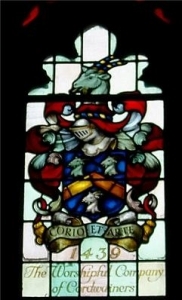 It is the church for several famous City Livery Companies with their own stained glass windows – Skinners, Vintners, Dyers, Tallow Chandlers, Painter Stainers , Innholders and the Cordwainers’ Company, with which the Ward has a close affinity and who lost their nearby Hall in the Blitz, whose window is pictured here. This church is home to a number of varied communities. For example, the Jacobite Syrian Orthodox Church, mainly expatriate Christians from the Indian subcontinent, worships there each Sunday morning. 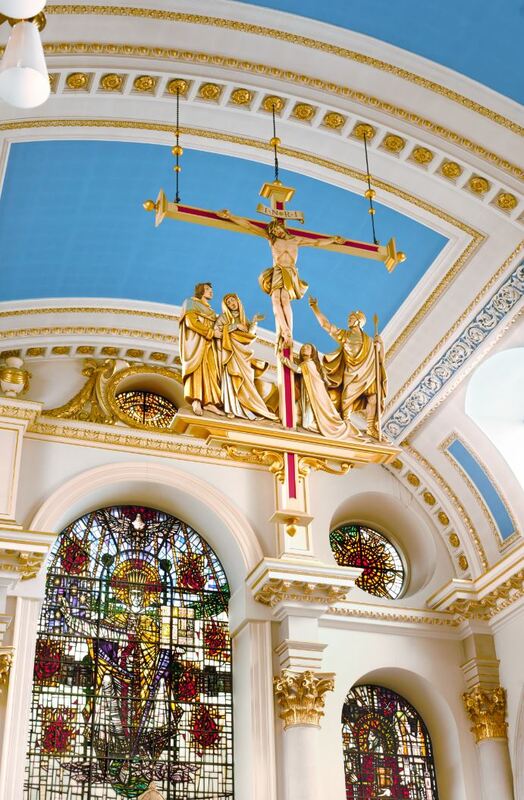 The Royal Tank Regiment has its’ spiritual home there, and their colours are in the north-west corner of the church. For some years the Wardmote has been held there each March when the Aldermen and Councilmen appear before their Cordwainer constituents and every four years stand for election.